I was strolling in a sporting goods store this weekend with my wife as she was looking for new running shoes. 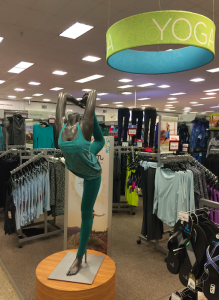 We were in the women’s section of the store, and there was a huge display that said YOGA. There was a life sized female mannequin doing Natarajasana (see above) wearing the “sweats du moment” that the yoga fashion companies are dishing out. I was surprised how vast the area was, when a scant 10 years ago there were no yoga parts of any sporting goods store. This seemed auspicious as Yoga seems to be more prevalent in modern culture. Then, I noticed a very disturbing detail. Amid the yoga sports bras and the yoga stretch pants there was no apparel to be found for men who do yoga.